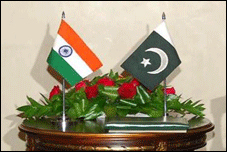 Pakistan and India will hold foreign secretary-level talks on Kashmir and peace and security, the two top issues in the recently revived Indo-Pak peace process, by the end of this month, but the diplomatic circles in Pakistani capital see no chances of any breakthrough in the vital talks owing to New Delhi’s fixation on the Mumbai attacks. Indian Foreign Secretary Nirupama Rao will visit Islamabad to discuss the Kashmir issue as well as peace and security with her Pakistani counterpart Salman Bashir. Apart from the two top issues, the top diplomats may touch upon any other issue such as Siachen, Sir Creek and Wullar barrage, but these major matters are exclusively the domain of foreign secretaries. It will be first formal talks between the two foreign secretaries on the core dispute of Kashmir after the Mumbai attacks in 2008 suspended the bilateral peace process. “Rao is coming to Pakistan later this month to discuss Kashmir and peace and security as well friendly exchanges between the two nations. Her visit is likely in the last week of June, but no final dates have been agreed upon and that is still being worked out,” a Pakistani diplomat said, requesting anonymity. He said the Indian foreign secretary would also call on President Asif Ali Zardari and Prime Minister Yousaf Raza Gilani apart from her formal talks with the foreign secretary. Nonetheless, no breakthrough is expected by anyone in the diplomatic circles owing to first such meeting after a couple of years and also India’s fixation on the Mumbai attacks’ issue. India says no progress on the peace process is possible without due punishment awarded to the perpetrators of the Mumbai attacks by Pakistani authorities. Prior to Pakistan-India foreign secretary-level talks in the resumed dialogue process, Foreign Secretary Salman Bashir on Wednesday held consultations with representatives of Kashmiri leaders. “In depth consultations on all aspects of the Jammu and Kashmir dispute were held. It was agreed that Jammu and Kashmir is the core issue and it was imperative to address it effectively and in a purposeful manner in the forthcoming dialogue with India,” a Foreign Office statement said. New Delhi said on Monday that it would raise the issue of alleged nexus between the Inter- Service Intelligence (ISI) and the perpetrators of Mumbai terror attacks during the upcoming foreign secretary-level talks.